I have faced, during my life, many unpleasant experiences; the growl of a mob; the personal threat of murder; the scowling distaste of an audience. But nothing has so cowed me as that day, November 8, 1951, when I took my seat in a Washington courtroom as an indicted criminal. Especially after World War II, Du Bois' concerns became increasingly international. In 1945, he helped present a petition on behalf of oppressed minorities before the United Nations. Du Bois was horrified by the Cold War policy of the Truman administration and believed that the efforts to halt the spread of Communism often obscured the real desire of colonial peoples to gain political and social self-determination. As he became more vocal in behalf of peace, he came under the suspicion of his government. During the McCarthy era, many attempts were made to silence debate on issues affecting foreign policy and Du Bois became another victim of that effort. At the age of 83, Du Bois was indicted for failing to register as a "foreign agent." 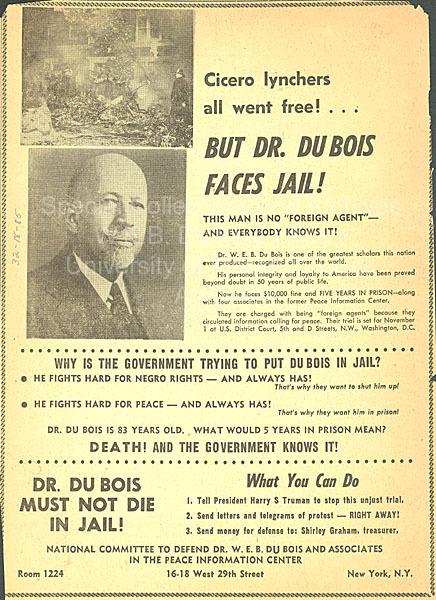 Although acquitted, the government had effectively attached a stigma to Du Bois' name and he became isolated from the mainstream of the growing civil rights movement which depended upon the goodwill of the Federal Government to advance its aims. In 1951, in the midst of his battle with the Justice Department, Du Bois, now a widower, married Shirley Graham, a friend of long standing, on the eve of his 83rd birthday. 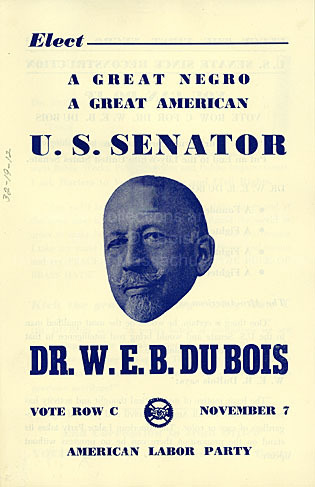 Du Bois carried his message to the political arena when he ran for the U.S. Senate in 1951 on the American Labor Party's ticket. Du Bois, with Shirley Graham Du Bois (right) and other indicted members of the Peace Information Center, in Washington prior to their court hearing. Throughout the 1950s, Du Bois' concerns became increasingly international, and he traveled and lectured on a number of issues including disarmament and the future of Africa. 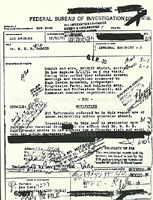 Throughout his career Du Bois was the object of investigation by Government intelligence agencies. 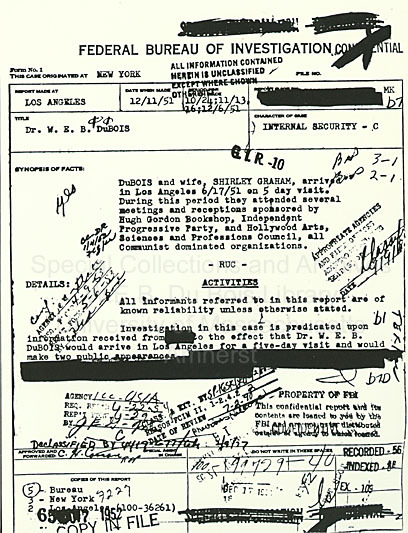 Especially during the 1950s, the FBI kept Du Bois' activities under constant surveillance. © 2004 University of Massachusetts Amherst. Site Policies. This site is maintained by Special Collections & University Archives.